The General Data Protection Regulation (GDPR) comes into force on May 25, 2018. Bring your store into compliance with the EU regulations! For PrestaShop 1.7, the module is available directly in your back office, in the Modules Tab, type GDPR in the search bar. The GDPR is a new EU legal framework that governs how users' personal data is used. It applies to all automated and manual processing of personal data (i.e., collection, conservation, extraction, use, destruction, etc.). Personal data is information that is used to identify an individual either directly or indirectly (i.e., first and last name, email address, IP address, telephone number, etc.). 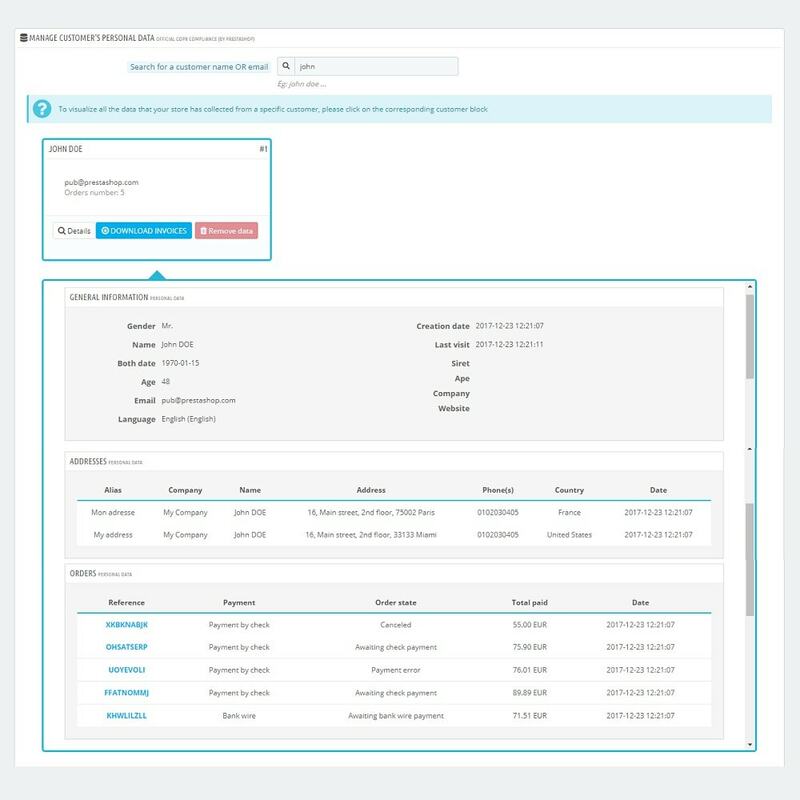 Why choose our GDPR module? 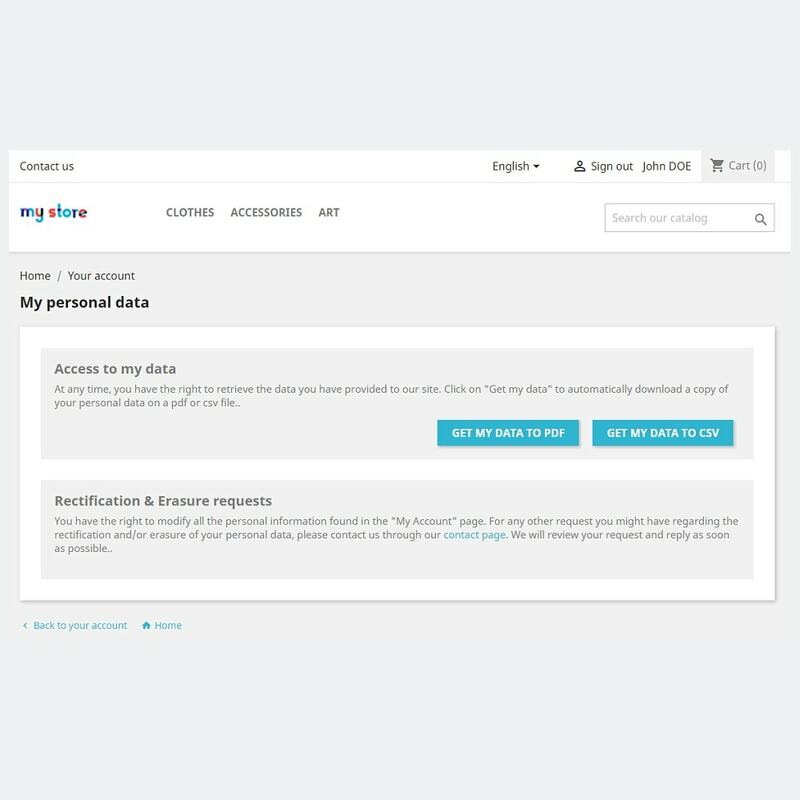 It also allows you to keep a log of all your customers' activity concerning their private data (notably data accessibility, permission and deletion). You will be able to demonstrate your respect for the regulation's requirements. If they request access to their personal data collected on your store, they can obtain an automatic export in PDF or CSV format. If they request their data to be deleted, they will be deleted permanently after your approval and verification by the module that deletion will not harm your site's operations. 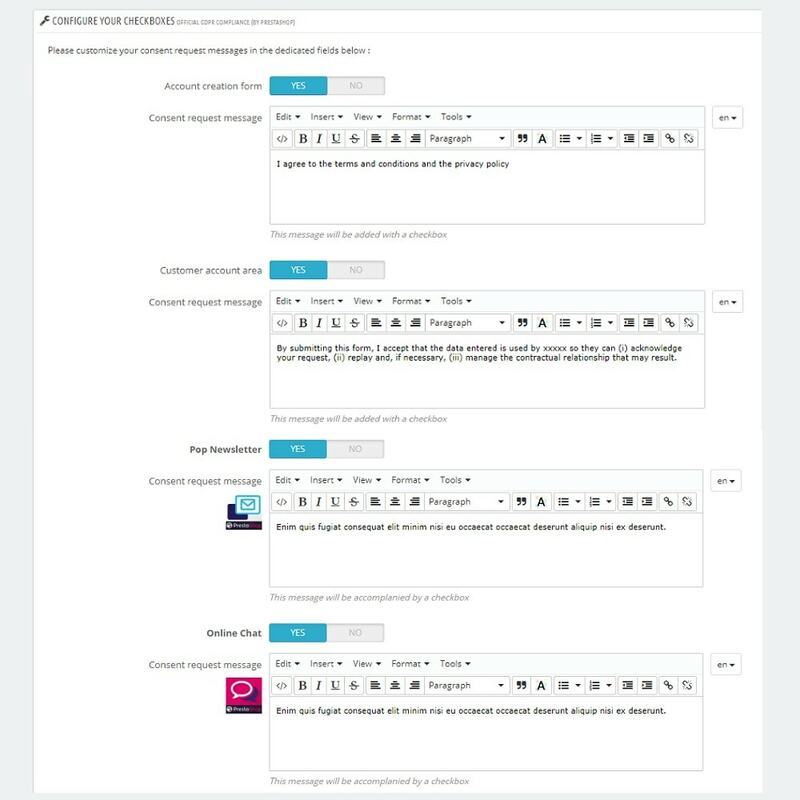 Customize the tick boxes to obtain permission and the related messages in the various forms on your store, notable account creation and newsletter sign-up. 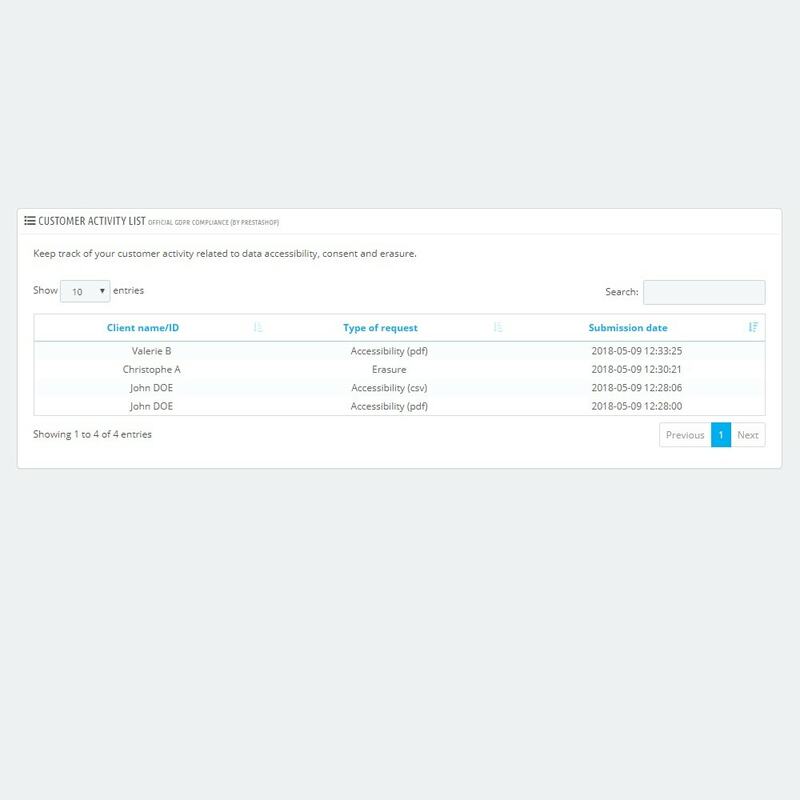 View all your customers' actions related to their personal data (notably data accessibility, permission and deletion) and export this dashboard. *Applies to EU modules that have been updated to be GDPR compliant. If you have any questions, contact your modules' developers. The General Data Protection Regulation (GDPR) comes into force on May 25, 2018. Bring your store into compliance with the EU regulations! 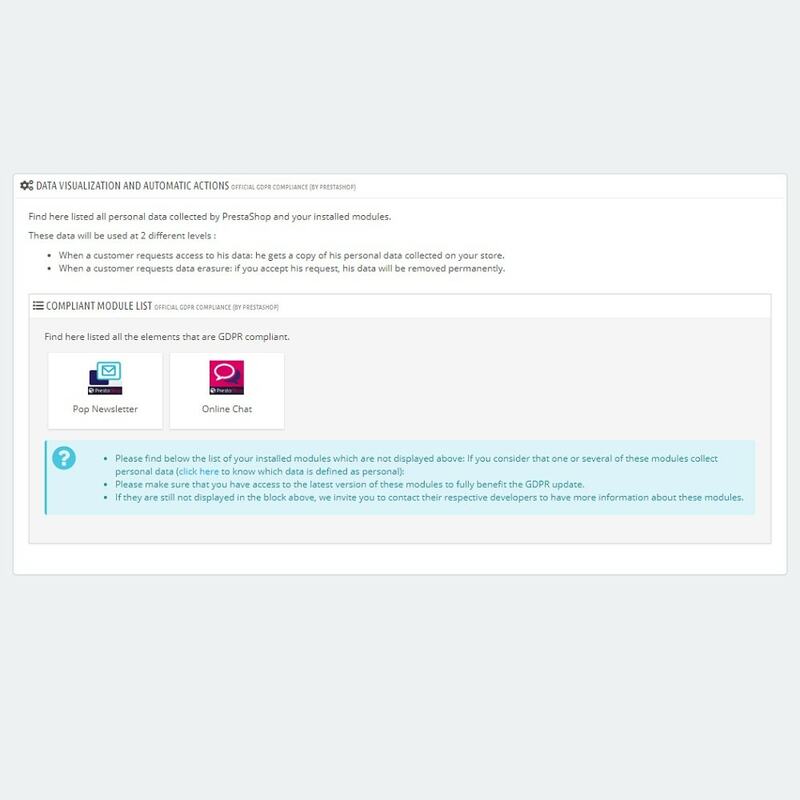 Developed by the PrestaShop team with help from our GDPR experts, the Official GDPR Compliance module is the only one that offers you a solution adapted not only for your site that processes the personal data collected by the PrestaShop solution, but also the modules installed on your store. * *More details in "Features" For PrestaShop 1. 7, the module is available directly in your back office, in the Modules Tab, type GDPR in the search bar. Now that they are reassured of how their personal data is used, they can browse your online store and place orders with total peace of mind. They can retrieve all their personal data collected on your store at any time in CSV format directly in their customer account. 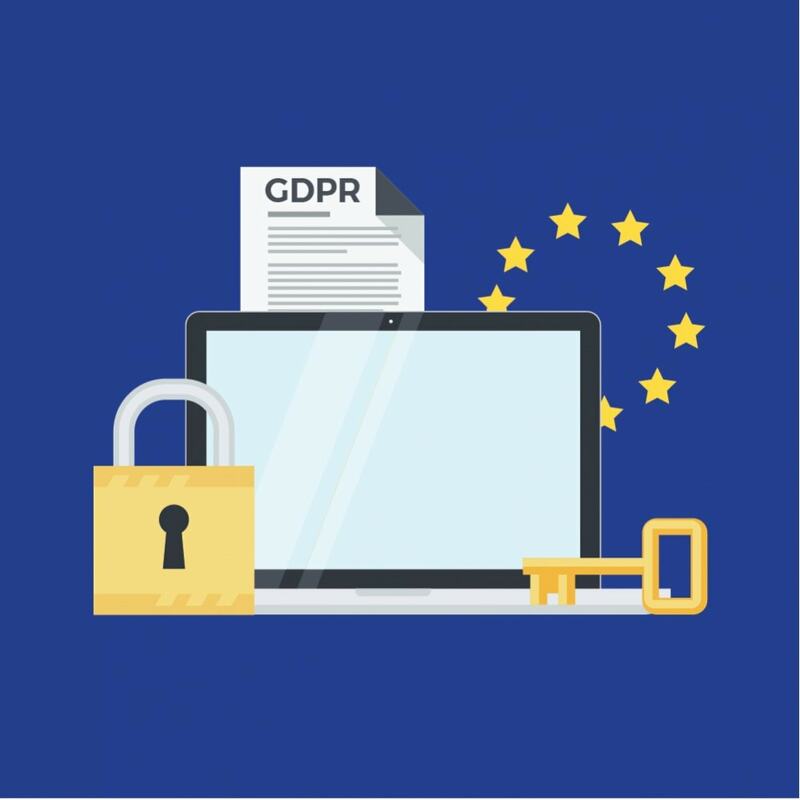 For more information about GDPR, take a look at our whitepaper. Very good: it takes a little bit of knowledge of the prestashop architecture to proceed, but very good.